I’m just going to say it: I love this book. I love that it functions both as a collection of linked stories and as a novel. Yes, each section/story focuses on a different point in time (between 2123 and 2171), a different set of characters (for the most part), and a unique mystery centered around alien intelligence or advanced AI, but all of them are concerned with the profound questions of consciousness and how humans could ever know if they were receiving signals from an alien intelligence–something so unlike our own. Thus, Ouroboros offers us several different ways to think through the same questions. I love the intensely exact detail that Hayashi uses to describe the development of what eventually becomes a small Dyson sphere that nudges a tiny black hole (named Kali) into orbit around Uranus. Over the course of the book, humans figure out how to harness the energy from Kali and use it to build out a sophisticated communications and commercial network that spans the solar system. And while humanity starts splintering into different factions (humans loyal to Earth vs. those loyal to Mars vs. those loyal to the Artificial Accretion Disk Development association, etc.- think The Expanse), the same strange gravity wave signal keeps popping up, suggesting to those paying attention that an alien intelligence might be trying to communicate. This is as hard sf as it gets (think the Three-Body trilogy) and even if you (like me) can’t quite wrap your brain around how this orbital platform links to that platform or this communications system is controlled by that AI, the momentum of the book and the palpable mystery at its center pulls you straight through to the end. And while I really really want to spoil this book by discussing the ending (an ending that some might see coming early on, but I always resist trying to guess endings, so it was a very nice surprise), I won’t ruin your experience of The Ouroboros Wave. It’s just that good. 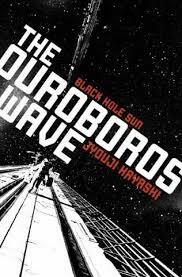 A huge thank-you goes out to translator Jim Hubbert, who enabled us Anglophone readers to enjoy this superb work of Japanese sf that we wouldn’t otherwise have had. And thanks to Haikasoru, which just keeps putting out excellent, enjoyable, mind-bending Japanese speculative fiction in English. Did I mention that I love this book? I think I’m going to go read it again now.